Gateway M285 is a This widescreen Convertible Notebook functions as both a conventional notebook and a tablet by incorporating a screen that swivels. 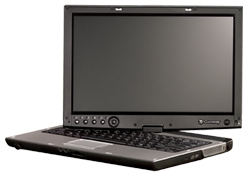 Gateway M285 features Intel Core Duo Processor T2300 with Intel Centrino Duo Mobile Technology, 14.0″ WXGA TFT Active Matrix (1280 x 768 max. resolution) with Rotating Hinge for Tablet Functionality, 533MHz DDR2 SDRAM slots, Serial ATA hard drive, 7-in-1 media card reader (Memory Stick, Memory Stick Pro, MultiMediaCard, Secure Digital, xD Picture Card, Mini Secure Digital, RS-MultiMediaCard), CD-ROM drive, 3 years warranty, Type II PC card slot, full-size keyboard and EZ Pad Pointing device, Gateway Executive Stylus Pen with Continuous Sensing Technology, Wi-Fi, USB2.0, FireWire, modem, integrated speakers and mic, TPM embedded security chip, and runs on Genuine Microsoft Windows XP Tablet PC Edition.